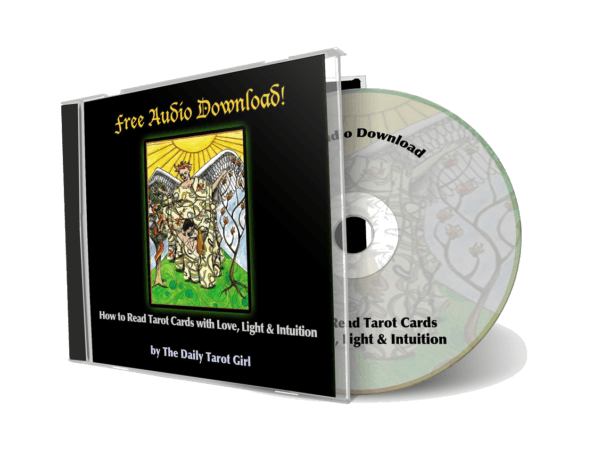 In last weeks post, we covered intuition and connecting with your Tarot deck as ways to enhance the quality of your Tarot readings. So now it’s time to dive a little deeper and tackle context and connecting the cards in a reading! Secret #3: Understand that each Tarot Card has many facets and it’s meaning and message will change with it’s environment (context). A fabulous Tarot reader knows that the cards – like people – are multidimensional. 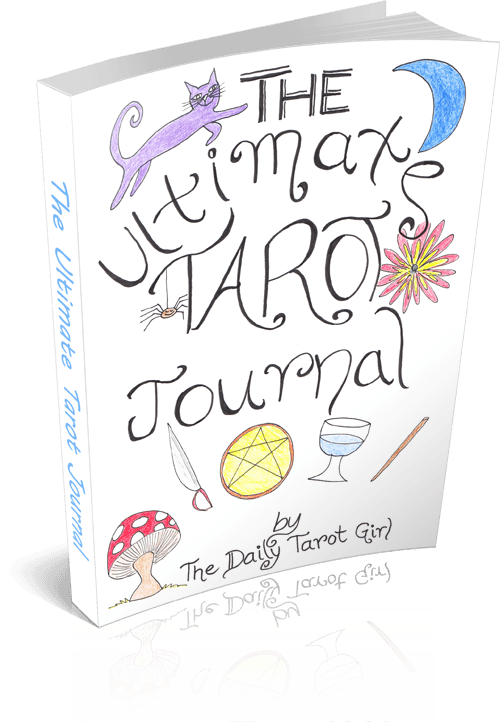 This throws a lot of readers off because let’s face it, most of us would prefer the Tarot cards had specific, clear definitions so we could know exactly what they meant. 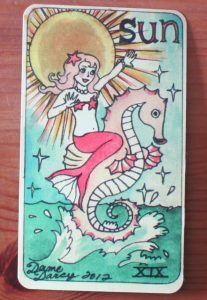 The fact that the Tarot card meanings are actually quite fluid can be frustrating – kind of like dating a flaky emo-guy who constantly changes his mind about how he feels about you. 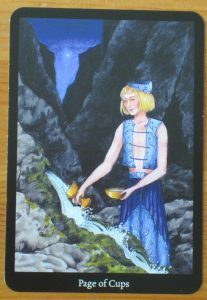 Page of Cups from the Anna K Tarot – he’s not just a pretty face! A Tarot card’s meaning is effected by the surrounding cards, the question/issue being asked about, the position in the spread and of course the readers intuition. Instead of seeing the Tarot card meanings as things that need to be defined and memorized, see your cards as beings. Get a feel for each card’s essence, vibe and energy – this isn’t the same as it’s meaning. It’s like when you meet someone new at a party: you learn their occupation (plumber) and relationship status (married five years!) which actually tells you very little about who they are. But you also get a sense of their energy/vibe, based on how you feel when you’re in their presence, which gives you more helpful information about what kind of a person they are. When you get a sense of a Tarot card’s essence and see it as a multi-faceted being, you will have an easier time deciphering it’s message when it shows up in a variety of readings and spread positions. Okay, I want you to look through your Tarot deck and pick out The Sun. Got it? Now look at it. Feel into it. Get a sense of it’s energy, it’s vibe, what it’s all about. Now, I want you to ask “what is the next step for me?” and look at The Sun. What is it telling you? Ask “What do I need to do to improve my overall vitality and energy?”….now what does it say? Ask “What do I need to let go of?” and see what it tells you. Ask “how can I improve my relationships?” and see what it says. How did it go? Did you get wildly different answers for each question? 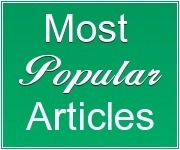 Did you get some new ideas and insights? 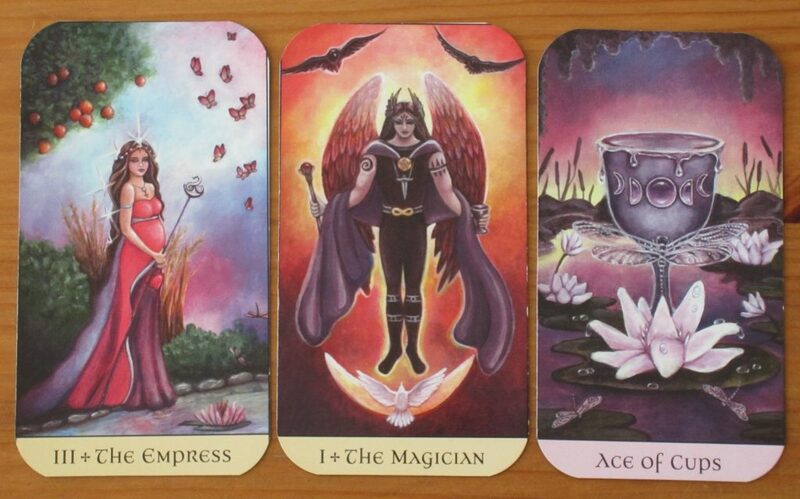 One of the biggest gripes I hear from my audience is that they have no problem reading a Tarot card on its own, but when it comes to doing a big Tarot spread, they find it hard to link the cards together to weave a “big picture” and tell a story. Telling a story with the cards is an art form. But it’s a skill that can be learned! When you make connections between the cards in a reading, it can feel like you are translating a thrilling letter or solving a mystery message that’s just for you. Think of a Tarot reading (or Tarot spread) as being like a letter. Each Tarot card is like a sentence in that letter. Each sentence means something, but all the sentences together give you a deeper, more meaningful message. What does this letter say to you? Don’t think too hard about this, just go with it – make something up! I read these 3 cards as saying you are in creative mode right now (The Empress) but you need to make sure you stay focused and intentional about what you intend to create (The Magician) so that you create something that is emotionally fulfilling and the start of something special (Ace of Cups). Of course, there are probably a million different ways to read these cards, that is just one possibility! 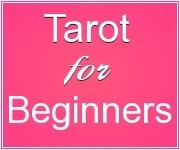 This entry was posted in March 2017, Tarot Tips and tagged how to read tarot cards, learn tarot. Bookmark the permalink. 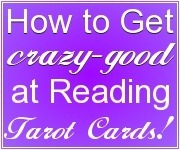 I would love to see the replay of “4 Secrets to a Fabulous Tarot Reading! I purchased my first set of cards about a month ago and have decided to get serious about learning to read tarot cards. Please contact me via email when the replay session will take place. Thank You! !